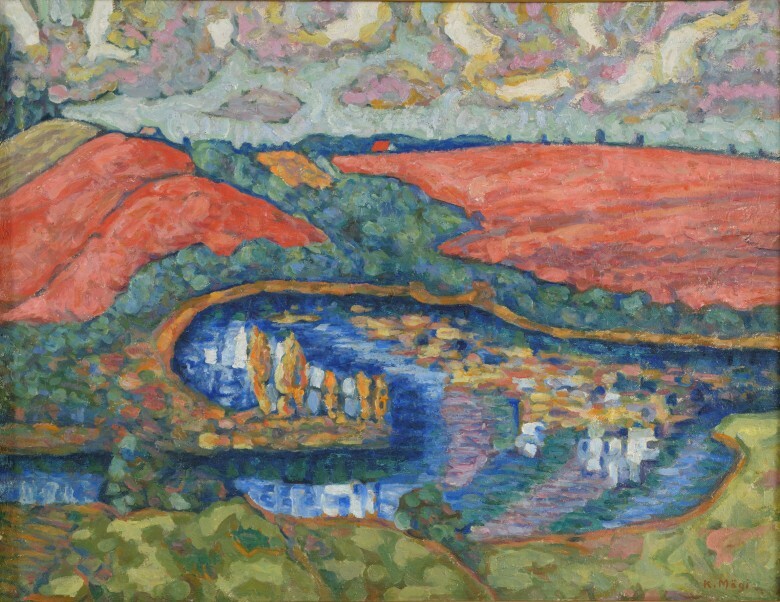 Konrad Mägi is often considered to be the most important painter in the history of Estonian art. Regardless of the fact that his creative career lasted only 20 years, he had a significant impact on the art scene of his time and on subsequent developments. Several ‘isms’ have been used to describe Mägi’s paintings. This is an indication of his strong capacity for synthesis as an artist and at the same time of the existence of his own distinct approach as well. Primarily landscapes, but also portraits, set the tone in his body of creative work. Konrad Mägi was born in Southern Estonia and studied in St. Petersburg but his education there was at a school that taught technical drawing. He left school without graduating and spent the summer of 1906 in Aland together with friends of his, who were writers and painters. It is there that the already 27-year-old Mägi started painting more seriously for the first time and he continued painting on his subsequent trips to Paris, Normandy and Norway. He worked in Estonia from the summer of 1913 onward and also founded the Pallas Art School there, which turned into the training ground for dozens of artists. Mägi travelled to Europe once again in the early 1920’s but his premature death in 1925 ended his intensive, productive and varied career as an artist. This painting is the first painting by Konrad Mägi known to have survived. In 1906, the 28 year old Mägi spent a spirited summer in Åland together with friends – writers and other artists. By that time he already had long-term experience in art: he had worked on technical drawing and also had come into closer contact with sculpture. 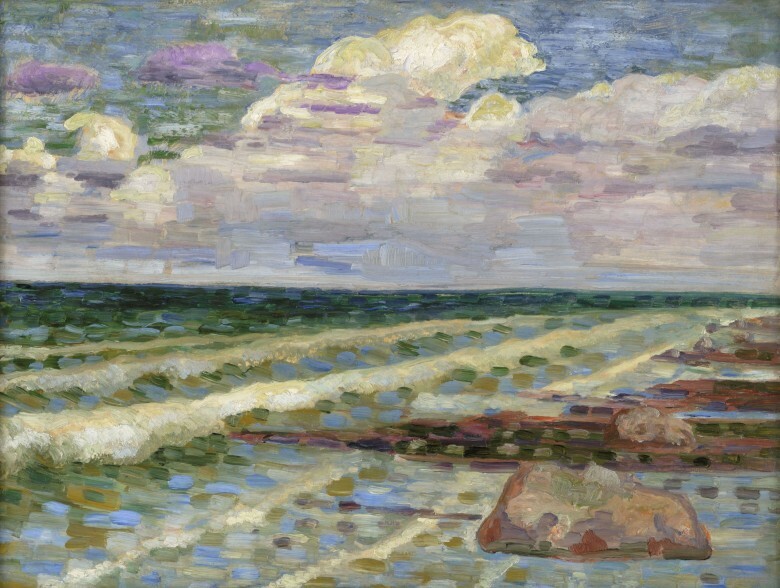 A year before going to Åland, however, Mägi had been expelled from art school in St. Petersburg and had in the meantime earned a living in Finland as an office clerk. 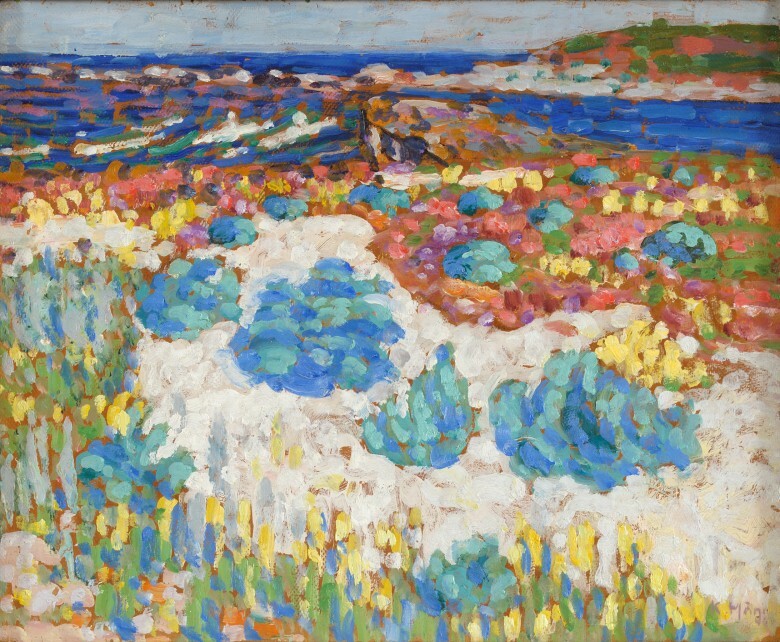 It is believed that it was precisely that summer of 1906 in Åland when Mägi started painting for the first time, and that he did so at the prodding of Nikolai Triik. It is possible that the energetic and youthful spirit of his circle of friends that fostered all manner of experimentation contributed to this. Mägi’s experiment, however, shortly turned into his main line of work. In the case of this painting, it should be remembered to what extent this painting could have appeared to be extraordinary in the mid-1910’s when the public, which was just then getting a feel for their first works of art, as well as a large proportion of artists thought of “nature paintings” as either dry, realistic puttering or romantic enjoyment of beauty but definitely not as vigorous and distinctive colour orientation. Even though most of the members of Mägi’s generation were of peasant origin or at least closely associated with rural life in their childhood – even Mägi’s own father was a former school teacher and steward of a manor – they did not approach nature sentimentally but rather from a modernistic point of view. Interacting with nature had already become somewhat ritualistic for them. 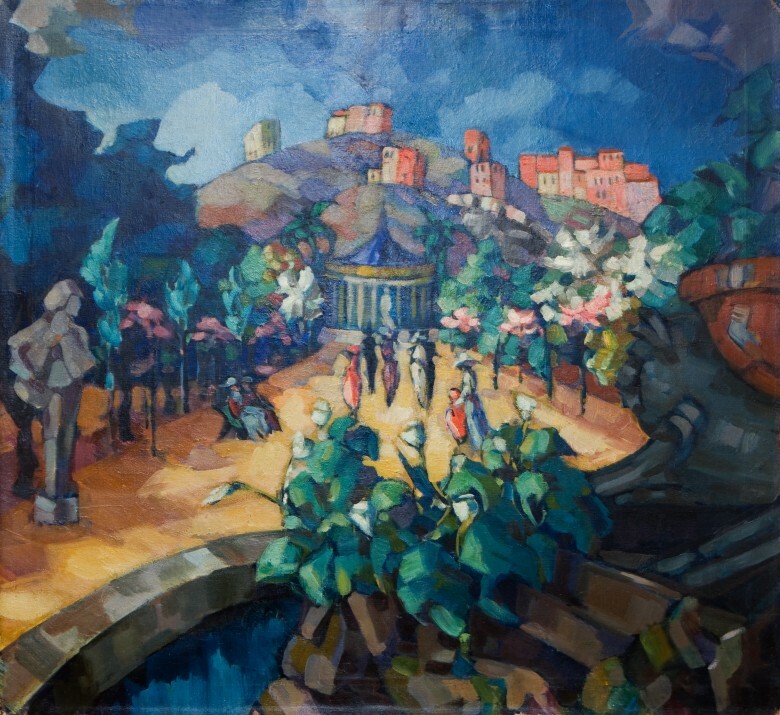 After living in metropolises abroad, they still sought inspiration as before from landscapes but it was not so much the wish to convey the beauty of nature that brought them there but rather the will to apply the methods of modern art and their own state of mind to elements found in nature. It is interesting to observe that the generations that followed them did not carry this trend further towards an even more urban approach but rather became to a great extent so called “pure” painters of nature in the 1920’s and 1930’s. This work belonged to the linguist and academician Paul Ariste according to the data in an exhibition catalogue from 1969. It is known that his art collection was formed before the Second World War already when Ariste was only in his thirties. Konrad Mägi’s Saaremaa period is well known and familiar. He was 35 years old when he went to Saaremaa. He remained on the island for two summers and created a series consisting of over twenty paintings in total. By that time, he had taken a great deal of trips and lived abroad for years (Russia, Finland, Aland, Norway, France). 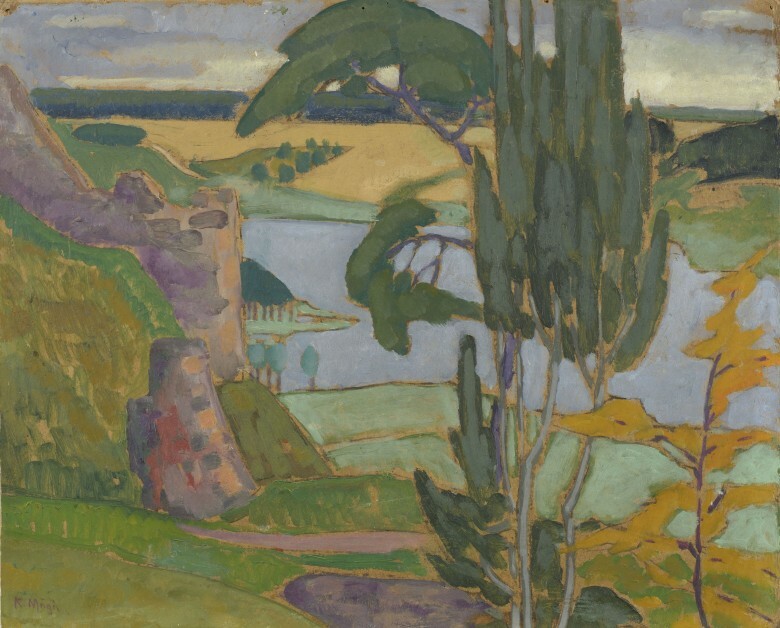 For this reason, Saaremaa is probably one of Mägi’s first depictions of Estonia. He had constantly grappled with poor economic conditions while he was abroad. At the same time, his health steadily declined: he had rheumatism. He arrived in Saaremaa in the summers of both 1913 and 1914 for treatment at a mud bath sanatorium. His longest stays turned out to be at Kihelkonna, near which these works were also probably painted. The summers of 1913 and 1914 that Mägi spent in Saaremaa were truly inspirational. Generally speaking, paintings are known from this period in his body of creative work where the seaside landscape sets the tone, or also inland scenes with pebbles, sea cale, a few buildings and other such features. For this reason, very few paintings are known in Mägi’s body of creative work that are dominated by the surface of the sea. His style was focused on small brushstrokes and on the colour contrasts and harmonies created through these brushstrokes. Thus, the sea with its flat structure and scant colours did not fit in with Mägi’s motifs. It is all the more interesting to observe how Mägi resolves the depiction of a new and surprising theme using means that he is familiar with. Konrad Mägi spent the summers of 1916 and 1917 at the home of his good friend Martin Taevere in Kasaritsa, Võru County. Taevere was a Supreme Court justice, but also a painter. Especially the summer of 1916 was very inspiring for Mägi. 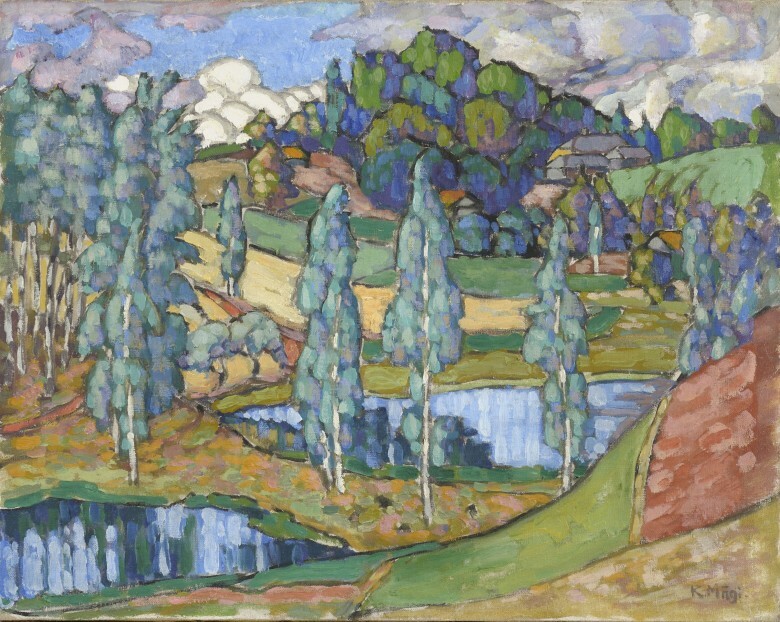 Taevere has recalled how Mägi went on painting excursions every day: “If a scene or harmony of colours in the landscape captivated him – he stopped right away, sat down and quickly started flailing with his brushes.” In this way he created 2-3 sketches per day, which he later completed in the studio. It has been surmised that Mägi’s inclination to the art of portraits was not so much due to his inner urge as to the profitability of the work, since the people who commissioned portraits were quite prosperous as a rule. At the same time, we do not really see any particular specific person in Mägi’s portraits but rather his ideal of beauty – his portraits are painted relatively similarly. Large eyes, pale skin, gaze turned aside from the viewer, all repeat in the case of several of his portraits. The model was the 23 year old Alvine Käppa, about whom little is known. Information on her is scant in the archives and thus it remains a mystery why Mägi painted her. They are not known to have been acquaintances. It is possible that someone commissioned Käppa’s portrait, yet Käppa herself was from a large farm family with many children and no information is available concerning how prosperous her father was. At the same time, a newspaper clipping from that time indicates that Alvine Käppa was one of the largest donors in the City of Tartu. 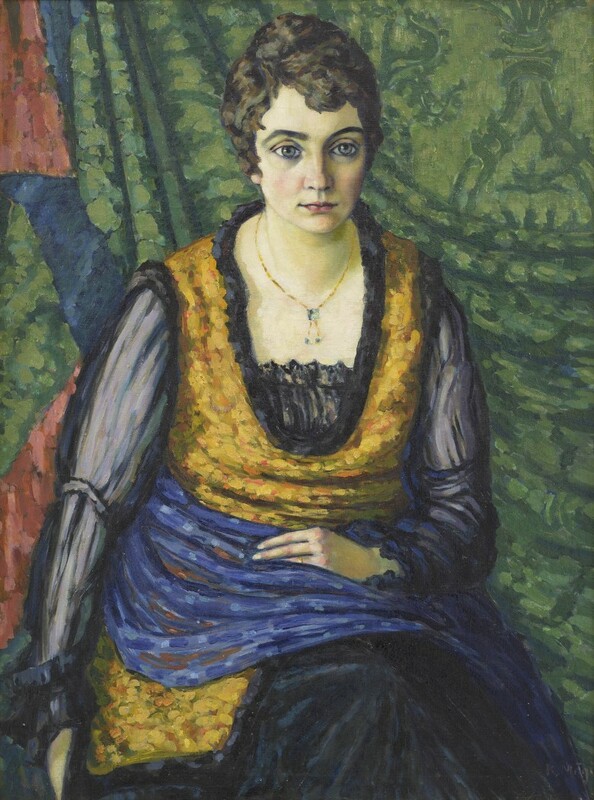 The painting belonged (at least not always) not to the Käppa family, but rather a note on the painting’s back frame indicates that its owner was the well-known art historian Mai Lumiste. Lumiste’s husband, however, was Rasmus Kangropool, whose father Rasmus Kangro-Pool cooperated with Mägi in founding the Pallas Art School, supporting the various undertakings of the Pallas school in the press. 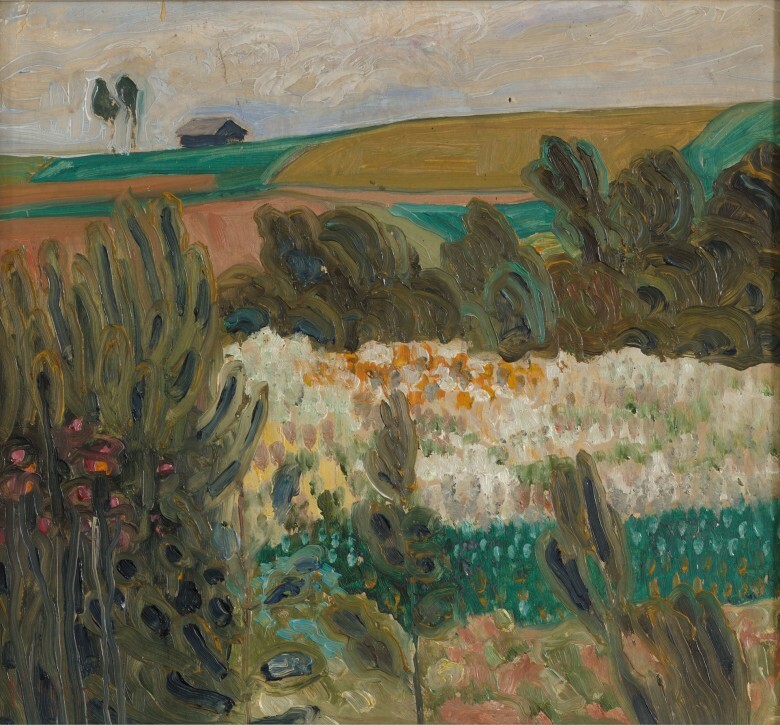 Konrad Mägi has gone down in the history of Estonian art first and foremost as a landscape painter. Nevertheless, portraits form a significant part of his creative work. He painted portraits throughout his career as an artist. 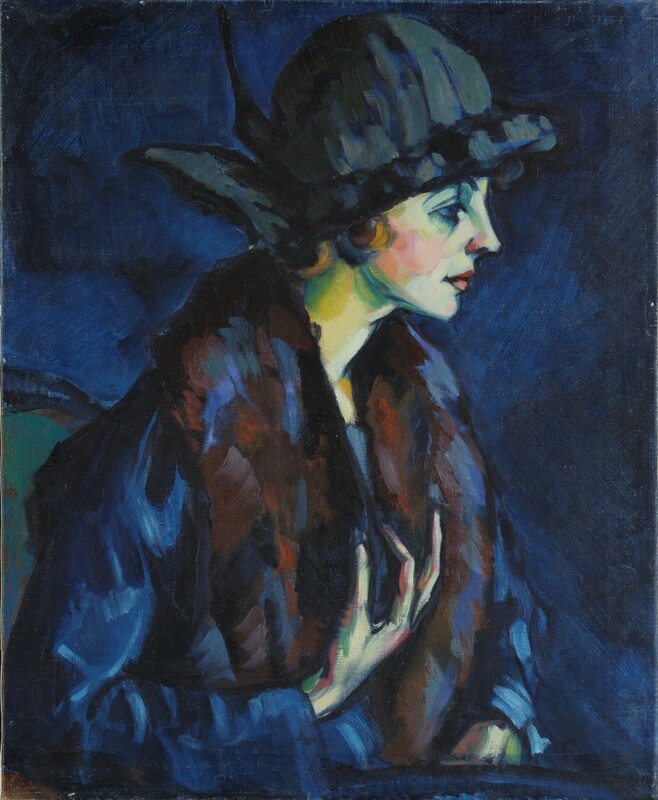 It is speculated that Mägi’s inclination to portrait art was not due so much to the inner urge of the artist as to the profitability of that work, since the people who commissioned portraits were quite wealthy as a rule. It is suggested that the model for this painting might have been the wife of a wealthy Tartu bookseller and publisher. Konrad Mägi yearned time and again to go abroad. It has been recalled that Mägi’s so-called land of his dreams was Spain. He never made it there but the exoticism of Southern Europe strongly attracted him. Even during the First World War, Mägi hoped that he would soon get the chance to travel abroad, yet the pause turned out to be longer than expected. It was not until the early 1920’s that he could undertake a longer trip, which was his first since returning to his homeland in 1912. He planned a trip to Italy via Berlin, remaining abroad from October of 1921 until the autumn of 1922. First and foremost, a certain abatement took place in his Italian paintings. The expressionist and sombre tones of his previous paintings were replaced by considerably more scenic means of expression. Mägi sent a postcard to Estonia in January of 1922 on which he wrote that “here in the near future I will travel south – perhaps to the island of Capri.” He arrived on the island in early March and wrote from there: “I arrived on Capri safe and sound. The island is divine.” He remained on Capri for about a month and completed some ten paintings there. His stay on Capri made Mägi happy, and this work abounding with air and light also gives an indication of this. Mägi frequently painted night scenes on Capri, where mountains and ruins were depicted under a romantically dark blue sky. 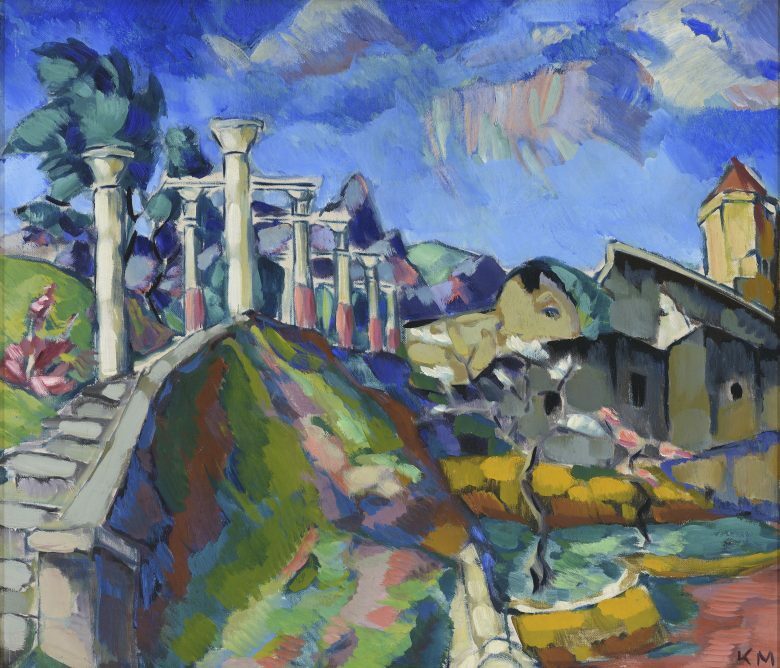 Mägi combines nature and ruins in this work as well – a frequently occurring motif that other artists also depicted in Italy. Italy was a place where people sought and experienced history even in the 1920’s at the height of modernism. The colonnade that Mägi has depicted is also an historical document of the onetime presence of people, a reference to the past that is visible and perceptible at every turn in Italy. The rearmost tower with the red roof was one of Mägi’s favourite motifs on Capri, which he has depicted on several occasions. The colourful side of the mountain, however, bears witness to Mägi’s ongoing wish to channel the primary attention in his paintings to colours and to also give a colourful general appearance to objects that are not as colourful in real life. 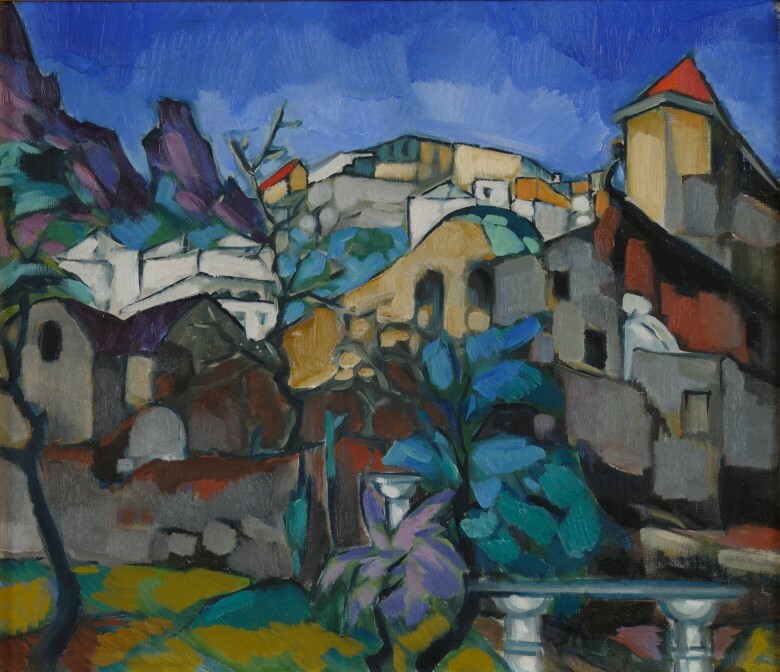 Konrad Mägi spent about a month on the island of Capri in the spring of 1922, yet he accumulated such a wealth of experiences there that he completed several dozen paintings on Capri and later in Tartu on the basis of those experiences. Mägi evidently got the idea of going to Capri from Ado Vabbe and Ants Laikmaa, who had been on the island previously already. Capri generated a feeling of elation in Mägi as well. He was happy on the island and worked fervently. While architectural motifs were previously absent from Mägi’s paintings (with the exception of a few churches and lighthouses), now Capri’s mysterious and romantic ruins came to the fore all at once. 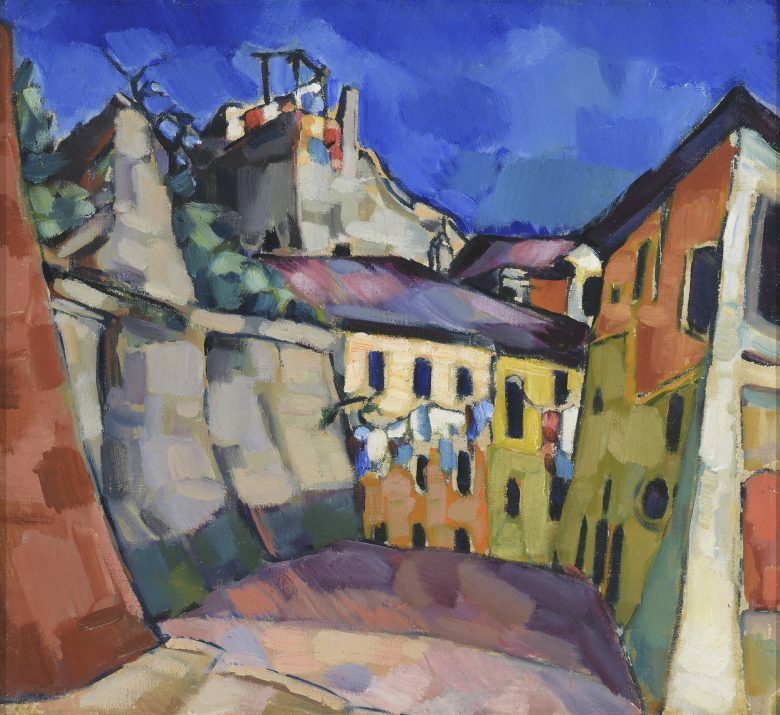 In this work, Mägi has not only painted ruins but also an entire city street, which is very rare in his body of creative work in spite of the fact that he lived practically his entire adult life in various cities. The laundry hanging out to dry over the street merits separate attention – this is a sign of people, which Mägi did not as a rule depict in his views of landscape and cities. It is also interesting to observe the blackening windows and openings, which number nearly 30 in this work: Mägi introduced this mysterious motif to his creative work precisely on Capri. 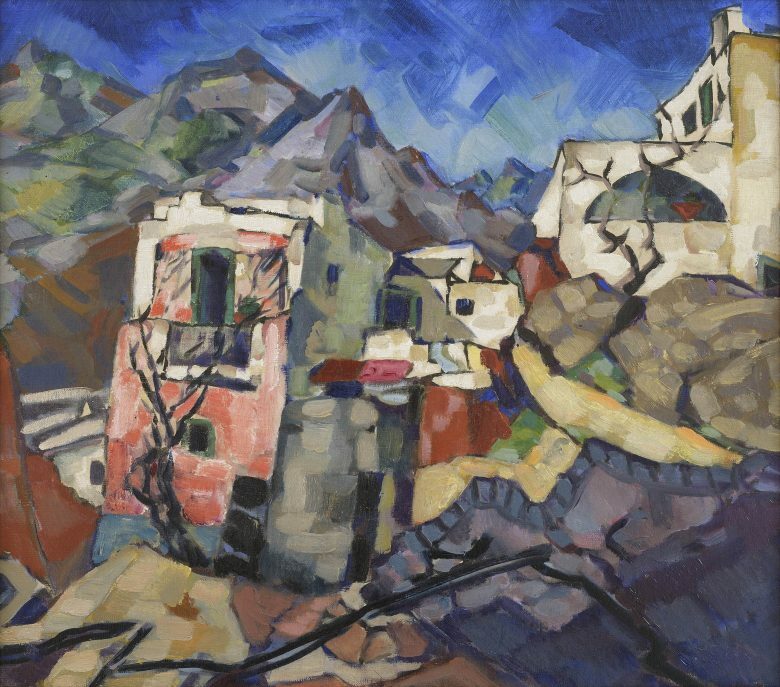 Konrad Mägi spent about a month on the island of Capri in the spring of 1922, yet he accumulated such a wealth of experiences there that he completed several dozen paintings on Capri and later in Tartu on the basis of those experiences. Mägi evidently got the idea of going to Capri from Ado Vabbe and Ants Laikmaa, who had been on the island previously already. Capri generated a feeling of elation in Mägi as well. He was happy on the island and worked fervently. While architectural motifs were previously absent from Mägi’s paintings (with the exception of a few churches and lighthouses), now Capri’s mysterious and romantic ruins came to the fore all at once. 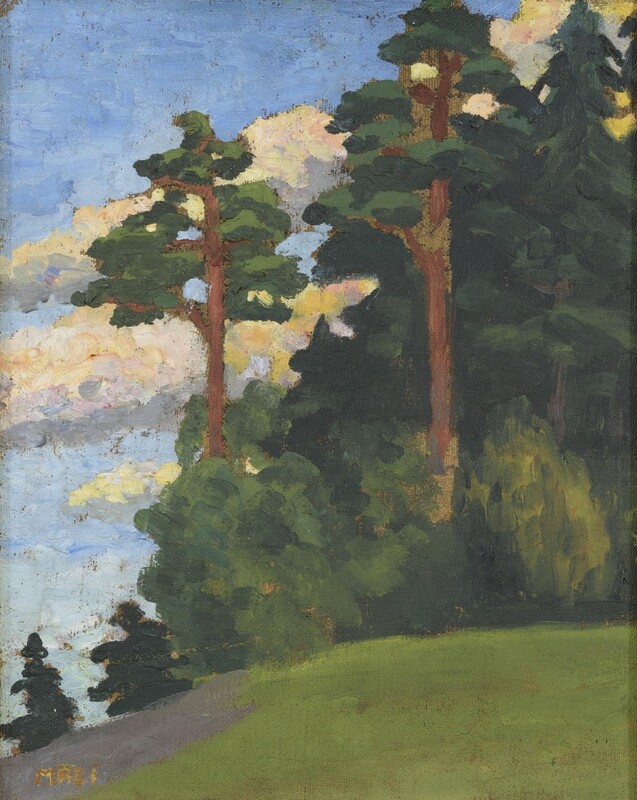 Similarly, Mägi now painted mountains for the first time, which he had also depicted a little bit in his Norwegian landscapes over ten years earlier. Mägi arrived in Venice in June of 1922 and stayed there until August. Some ten of his paintings with Venice as their subject have survived. 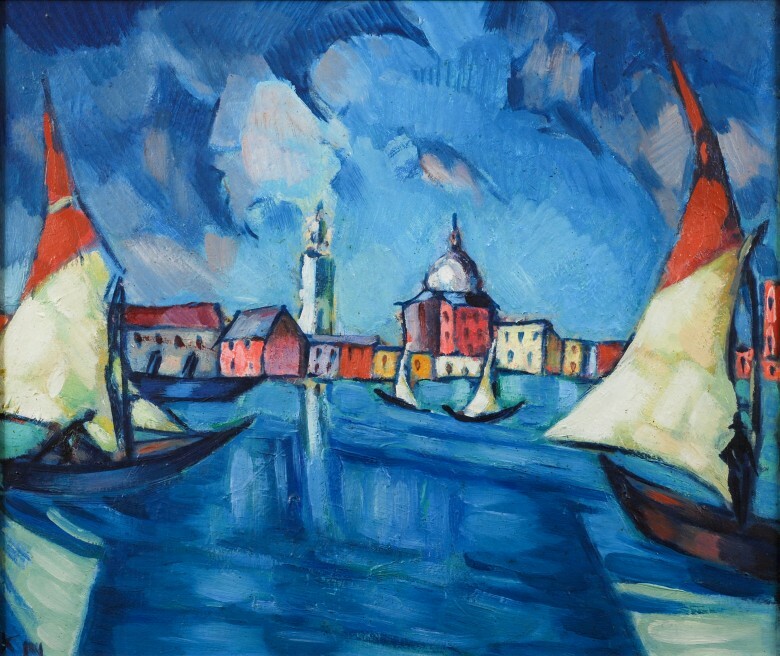 The variation of one main motif in other works is frequent: subjects repeat in many paintings that are also in "Venice": gondolas, the towers and houses of the city in the background, the blue sea in the foreground. Many a time, Konrad Mägi worked conceptually in series. He could focus on some motif and repeat it in different variations (different angles, different formats, etc.). In this way, Mägi succeeded in completely painting some motifs “through and through”. 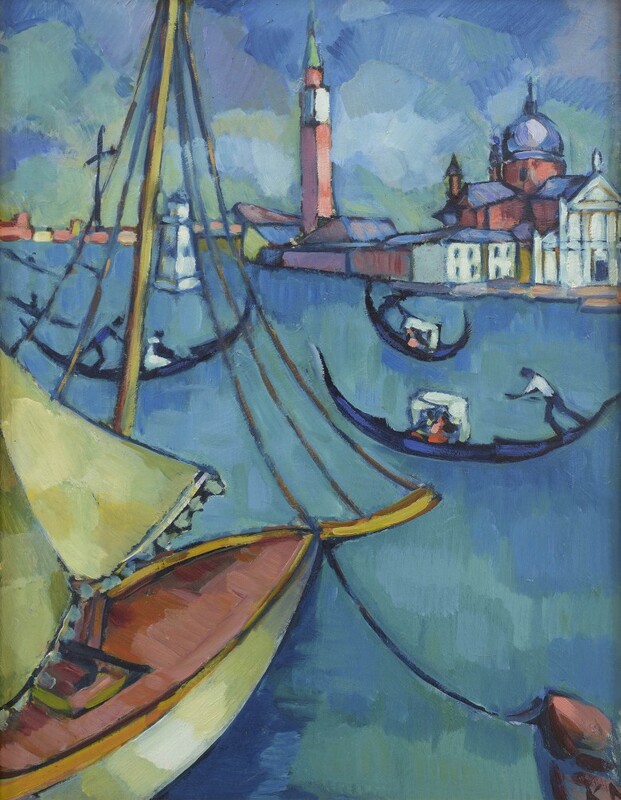 Mägi worked on this scene of Venice – blue water, gondolas, architecture characteristic of Venice in the background – through several paintings. It is interesting to note how he experimented not only by making the format larger and smaller, but also through the placement of the format. While in the case of Mägi’s Venice scenes we are otherwise accustomed to the fact that they are horizontal (paintings that depict water surfaces are horizontal as a rule), in this case he has chosen a vertical format. This makes the treatment of the motif considerably more focused. While the horizontal painting conveys the dynamics of the movement of the gondolas and their smooth gliding along the water, this painting is more like still photograph taken at a very precise moment that summarises what is characteristic of Venice in one moment.